STOP! If you have just arrived at this website looking for an ebb and flow hydroponics system, you might want to go back to page one of this mini-farm plan. NOW, let's get this sucker planted! 10. Now for the plant pots. 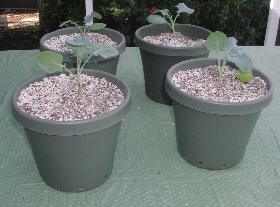 I used 8” green flower pots from Home Depot, for a couple bucks each. They didn't quite fit in the bin, so I trimmed some of the lips on the tops of the pots with a razor knife so they then fit in nicely. I wanted the largest pots I could possibly squeeze in there. 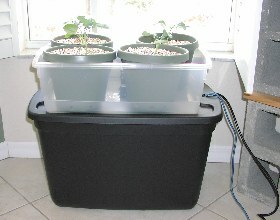 You could also use several smaller pots if you wanted to grow herbs or the like. 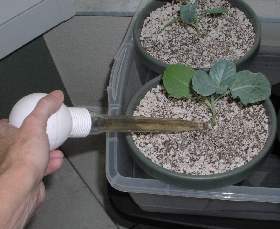 Drill several 1/4” or 3/8” holes around the sides of the bottoms of the pots, to provide good fill and drain of nutrient solution, as shown below. 11. 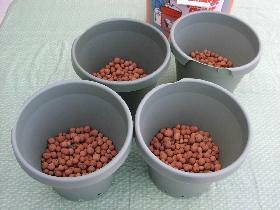 Fill the pots with your favorite hydroponics medium. 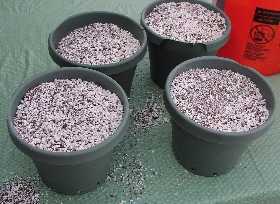 We recommend a 50-50 mixture of coco coir and perlite, with an inch or two of LECA (Hydroton or clay balls) at the bottom. 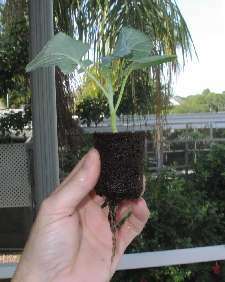 The coco/perlite mixture provides great moisture holding and aeration. 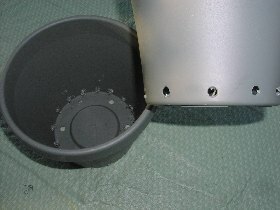 The hydroton at the bottom keeps the medium from flushing away out the drain holes. It makes a great sub-layer wick for ebb & flow pots. 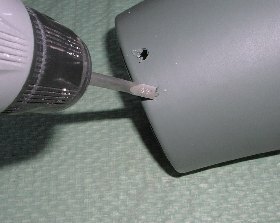 (More details and ordering of media in the Tips 'N Techniques section at the end). 12. 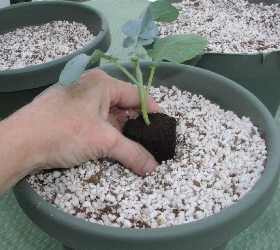 Now plant your seedling plants into the pots and pack the medium firmly around the plant. 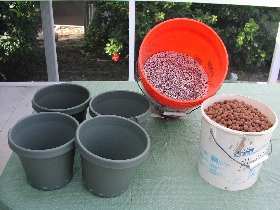 You cannot start seeds right in ebb & flow pots, as the moisture will not reach the top to keep the seeds moist. 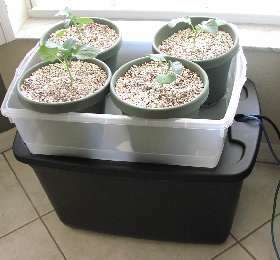 Start them first in grow cubes or pellets, or buy store-bought seedlings and rinse away all the dirt from the roots before transplanting to the pots. 13. It's a good idea to “top water” the plants for the first few days to make sure they don't dry out while they get used to their new ebb & flow home.